It's a higher register in English but I can't think of another way of putting it, other than maybe the head slicers, which I don't think would be understood. 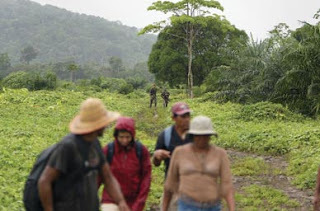 I got the term from this fantastic investigative article by Teo Ballvé in the Nation, which exposes how through USAID the US government is giving 'drug war' money to brutal paramilitary drug traffickers for growing oil palm for agrofuel, on land they've stolen from Afro-Colombian peasants. (the article isn't gruesome reading, despite the term - though certainly it's plenty disturbing to find yet another way in which US "aid" to Latin America is deeply screwed up). It's crazy that Obama has just sent a proposal to Congress that keeps the same very high levels of military aid going to the Colombian army, which works closely with these "palm growers". Please take a minute to send this quick click action email to Obama about it.